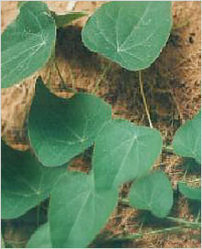 Common Name : Velvet Leaf, Abuta, Pereira Root, Barbasco. Part Used : Whole Vine, Seed, Bark, Leaf, Root. Habitat : Found in tropical region of india. Uses : Velvet leaf or Abuta is antibacterial, anti-inflammatory, antihistamine, antioxidant, antispasmodic, diuretic, hypotensive, muscle relaxant, uterine relaxant, antiseptic, , analgesic, antihemorrhagic, cardiotonic, diaphoretic, expectorant, febrifuge, hepatoprotective stimulant and tonic. It is known as Midwife's herb as mainly used in women aliments. It is used for menstrual problems, hormonal imbalance, ease childbirth, postpartum pain, prevent threatened miscarriage, and control uterine hemorrhages, hormonal acne and premenstrual syndrome. It is used for heart problems, kidney stones, kidney infections and pains, asthma, arthritis, muscle cramps and stomach pains. It is also used to kill bacteria, prevents convulsions, ulcers, indigestion, skin irritations, cough, fever, intestional worms, wounds and in snake bite. It is used against poisonous snake bites and is very effective in skin related aliments.